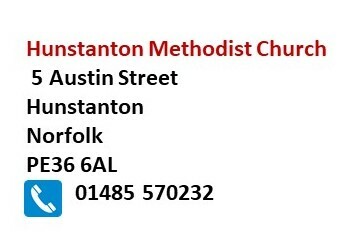 Hunstanton Methodist Church premises are fully accessible from a shingle surfaced car park. They comprise the Link, the School Room, the Hall, the kitchen and the Worship Area. The Link provides the entrance to all other areas, as well as being a bookable area itself. The Link is carpeted and has under floor heating. It can be used for meetings, displays and exhibitions. There is a serving hatch to the kitchen. The carpeted School Room is ideal for small meetings and seats 12-16 people comfortably. The Hall is light and airy. It has a vinyl tile floor, comfortable metal-framed stackable chairs, some large plastic-topped tables and some smaller ones. There are black out curtains fitted at all the windows. These features equip the hall for a variety of uses. 70 people can be seated comfortably (maximum 100). The premises are serviced by a toilet block that leads off the Link. An additional accessible toilet with baby changing facilities is situated outside the School Room. There are also some Ladies toilets off the Hall. Hire charges for the use of these premises contribute to the work of the church which includes the upkeep of the building. To make a booking call David on 07925 160884. This phone has an answering service if David is unavailable. Please leave a message and he will get back to you as soon as possible.